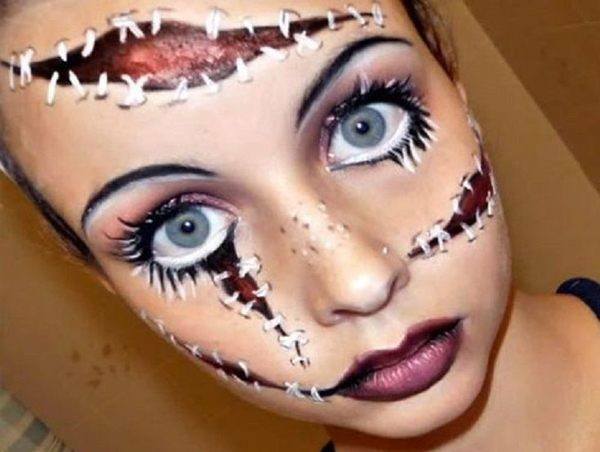 One of the most creepy makeup that you can do when Halloween arrives is a Halloween doll makeup. The makeup for this celebration has to be the one of one of those scary dolls. 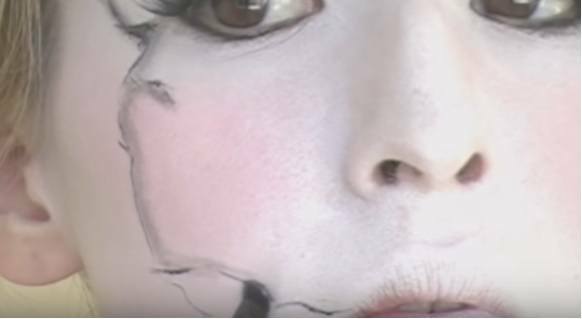 It may seem like one of the most complicated makeups there are, but in fact, if you follow our tutorial on how to do a creepy Halloween doll makeup step by step. You will be the most terrifying of them all. 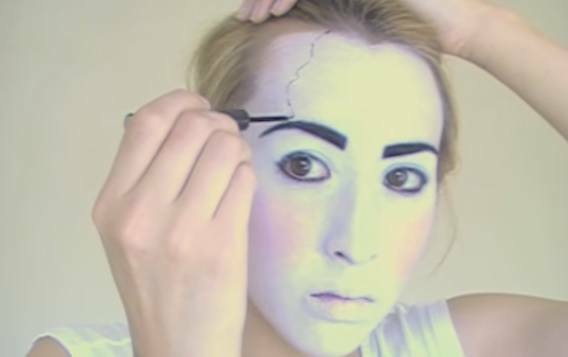 Here’s how to do a creepy Halloween doll makeup. 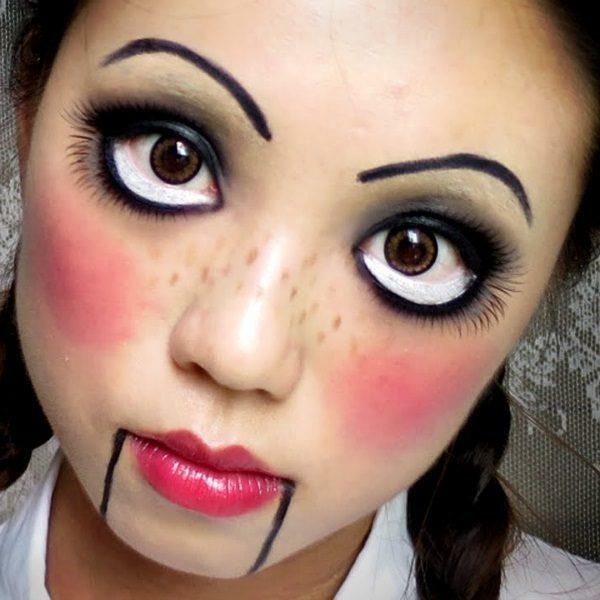 If you wish to make a creepy Halloween doll makeup, you have many images on the Internet that will serve as your inspiration. From modaellas.com we want to help you and show you step by step how to do it, although before doing so, we better list what you need. 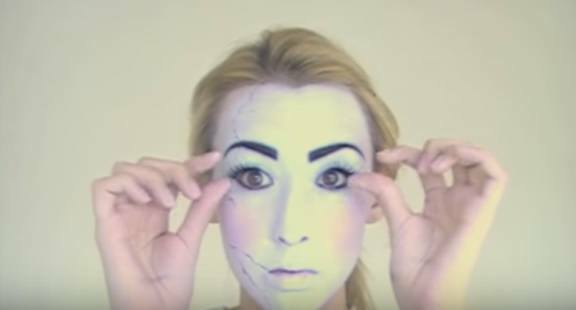 Let’s explain how to do the makeup step by step and then how to give the “creepy ” touch: to make our face look like it has been broken. Are you ready? 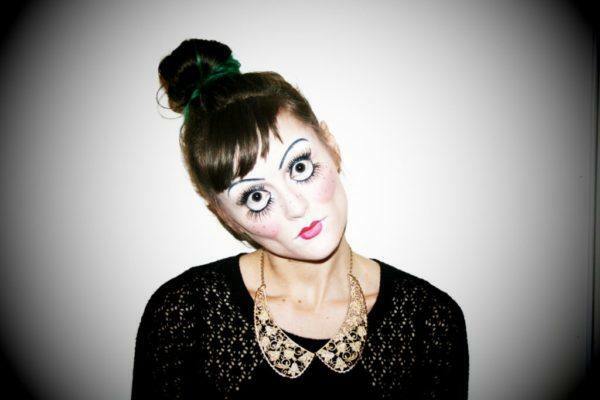 The first thing you have to do for a good Halloween doll makeup is to apply white foundation. Just bare in mind here at modaellas.com we advice you to apply a product to prepare your skin first and then apply the white makeup foundation. 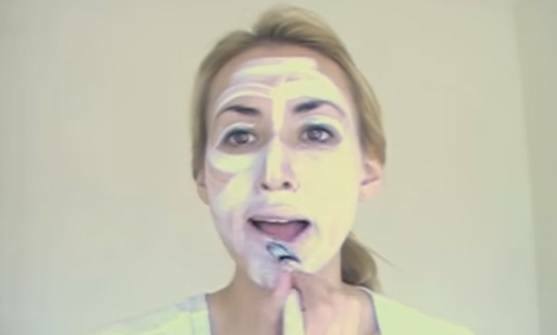 Once you’ve applied such product, you can start painting your face in white. For this you can buy cream makeup, which will actually be much more effective. You must spread the makeup with a brush. Draw lines and then blur them so you can have the whole face painted in white. You should then apply a bit of white powder, which will allow you to remove any sort of glow and that will be useful when it comes to finish covering the eyes. You should use a brush that is small and thin, and do your makeup of the area of ​​the upper eyelid, next to the lower eyelid. Then, take a brush that is quite thick and dry white powder to do your makeup of the area of ​​the forehead and cheeks. 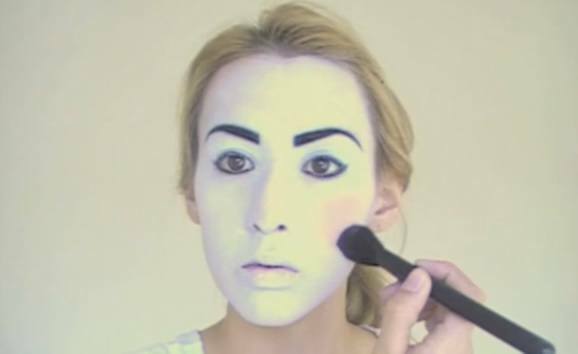 Make sure you have good powders all over your face and areas where you applied the white makeup. Then you have to make sure it stays put. You should feel your face as elastic as ever. We start to do the eyes makeup little by little. To do so, we shall use the black pencil and draw the line at the bottom, followed by the line at the top. 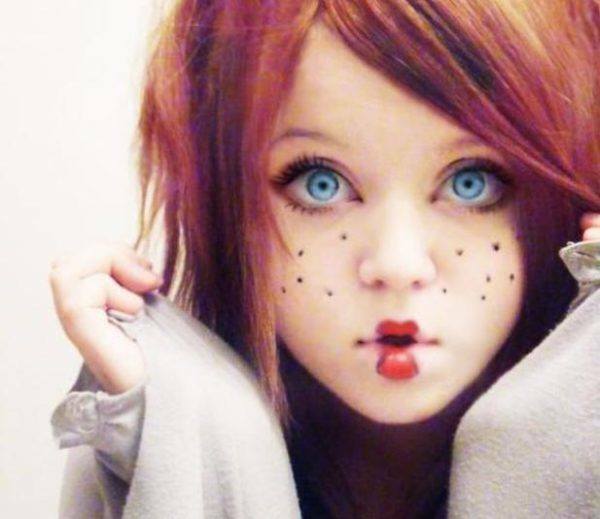 This is the final result and what your eyes should look like, also try to exaggerate the corner of your eyes makeup in order to make believe you are a doll. For the eyebrows, you only have to make them thicker if your natural eyebrows are too thin. Another reason to paint the eyebrows is to make them look darker. 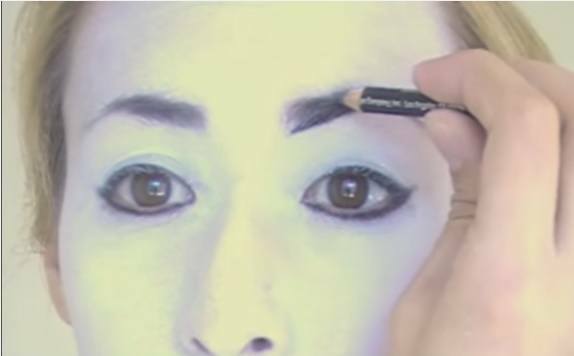 To do this, pick up the pencil and draw a more or less thick bow (depending on the thickness of your eyebrows) and mark it slightly with the black pencil. You have to make sure that the final result looks like the picture above. 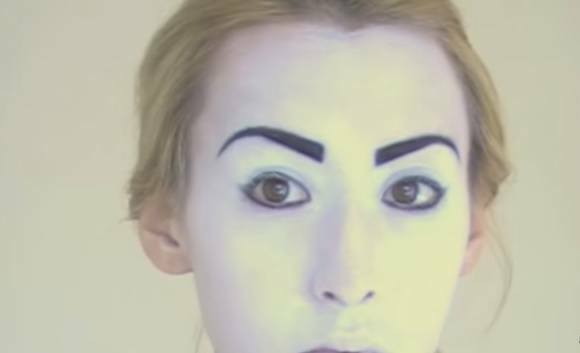 You should use only the color black so the eyebrows look as artificial as possible, like the eyebrows of a doll. Let’s go for it and define the blush on the cheeks, something that is essential for a Halloween doll makeup. Take the shadow or pink blush and do the makeup. You should paint from the cheekbone area upwards. Do not be afraid to go to far: the more you make it noticeable the better, since we want to make believe we are a doll. Once the blush is applied, a good idea is to apply some translucent powder so that you can tint and “shine” a little more. 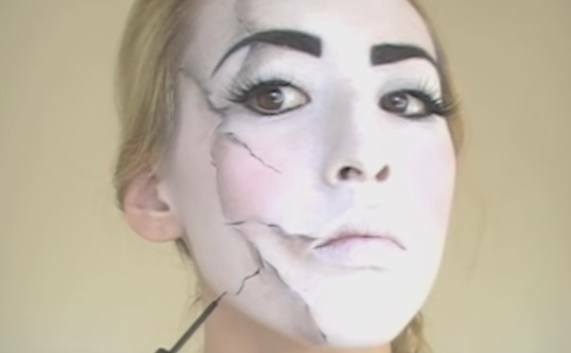 To create the effect that our porcelain face is broken, we have to draw several lines on the face. There is nothing like the liquid eyeliner to do so. You start from the front and draw a stripe with the liquid eyeliner that does not have to be a straight line. You can slightly vary the direction if you want. It is not necessary to draw a very thick line. In fact, you can try to make the line fade away and then reappear. 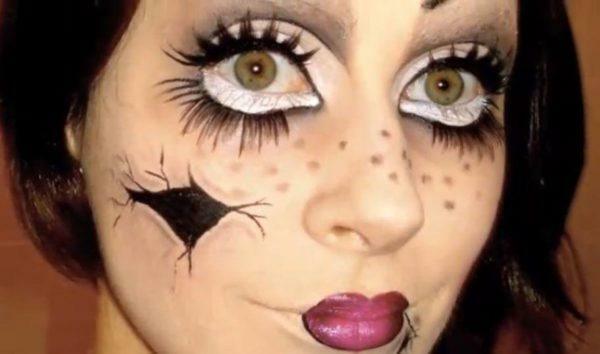 It is best that you use fake eyelashes for this Halloween doll makeup. They should be quite thick and long in order to make you look like a doll. With the help of a brush to blend, we create shadows around the lines that can imitate broken or cracked porcelain. 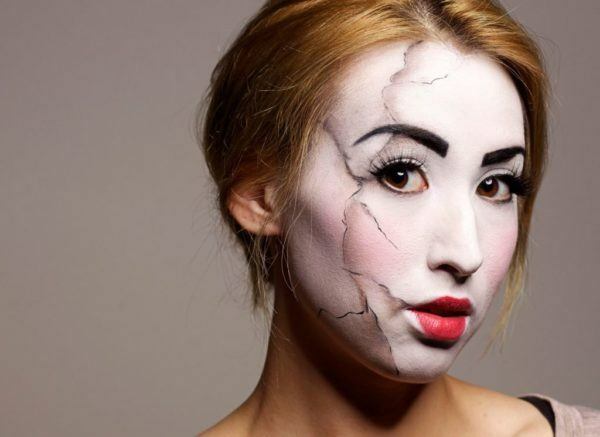 In this sense, we can make those cracks or wounds deeper and, therefore, make them look much more real. In this image we can see how to create the shadows of the face. You can do it all over the line that you have drawn, or wherever you consider the crack should be more marked. With the help of a second brush, you can finish blending so that a thicker shadow can be seen. Use the eyeliner again to draw more lines over the blended shadows. In doing so, you will achieve a result like the one you see in the picture above: your face will look like cracked porcelain. In order to do the lips we must shape the lips with a lip pencil first to make our mouth look smaller, like a doll. Then we can start dabbing the lips with a lip brush, drawing on the upper and lower lip. 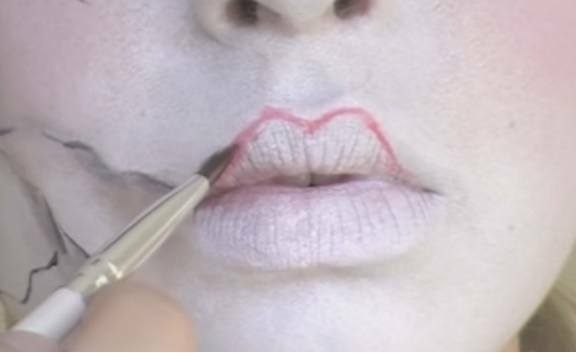 The rest of your real lips should be painted in white. Once you have drawn the mouth, you must paint the already shaped lips. First in pink, and then you can get a darker color, such as cherry. Ready! This is the final result and how a creepy Halloween doll makeup looks like. Doesn’t it look spectacular? We have explained step by step how to do a Halloween doll makeup video. Now let’s see how to do this same makeup through this video. 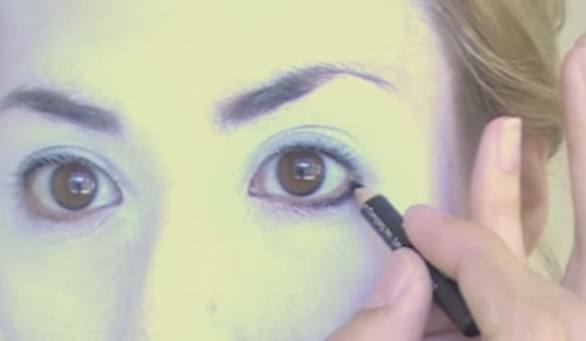 We have seen a tutorial that was quite elaborate, but the truth is that in order to look like a creepy doll this Halloween we don’t have to complicate ourselves so much. We just have to draw some freckles (before having applied a clear foundation) and then put some red lipstic on, although shaping the mouth to look like a doll. We do the eyes with a little bit of eyeshadow and we put false eyelashes on to make them look bigger. 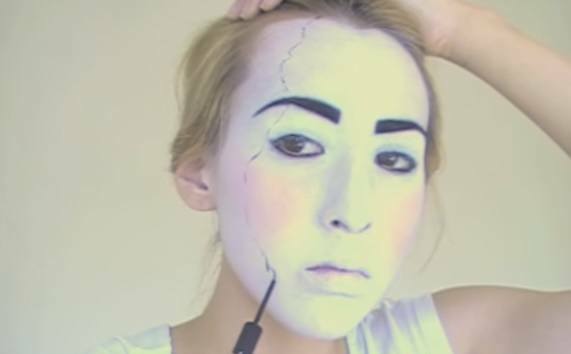 If you liked what we did in the tutorial but want something less elaborate, try to do just one crack to make you look as if your procelain doll face was broken. 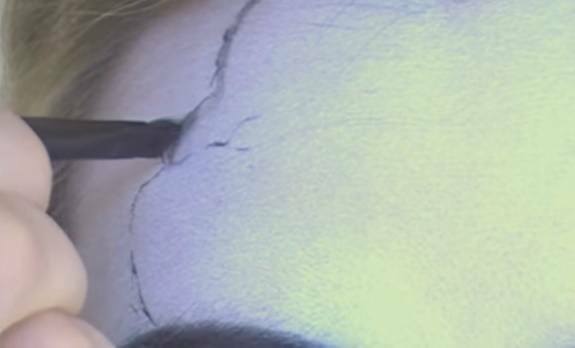 Do the makeup of the cracked area with a little bit of black color and then add some “threads” or lines drawn with an eyeliner. Blend them a little bit and there you go! You know how the rest of the makeup it’s done: do the mouth as if it were smaller; do the eyes and apply false eyelashes but also draw other eyelashes above and below the eyelids. Do not forget to add a few freckles! Another thing you can do is to choose to define the cheekbones and make them look like the ones of a doll. There is nothing better for doing this like some red rouge. Also paint the freckles that we mentioned earlier and also make make two black vertical lines in each corner of the mouth, wich will truly make you look like a doll. Do the makeup of the eyebrows too, above your own (cover them with some foundation) and white makeup, under the lower eyelid to make your eyes look larger. Making the eyes bigger relys on a very simple”trick”, which consists on painting in white the area under the lower eyelashes. From the tear up to the other end, so it will look like your eyes are wide open. And if you are thinking of becoming a monster high kind of doll, take a look at the picture above and try something different. 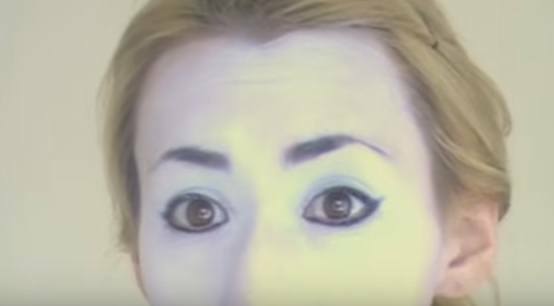 You do your makeup with white foundation, but then with black liquid makeup you can paint those fleckles, the corners of the lips and the rim of the eyes. We also leave this photo gallery so you can be inspired by other doll makeup options.